British art-rockers Wild Beasts know how to keep their cool, both musically and literally. Taking an early slot at the Pitchfork Music Festival, the band took to the hot and sunny midday stage almost all clad in long-sleeved shirts and jackets, but remained calm and collected throughout their entire set. Even cooler, though, was the band's precise performance of howling harmonies, infectious rhythms and shimmering riffs that shone even brighter than the sun. Lead singer Hayden Thorpe was of course a highlight, seamlessly leaping from falsetto to baritone on tracks like "Wanderlust" and Two Dancers standout "Hooting and Howling." 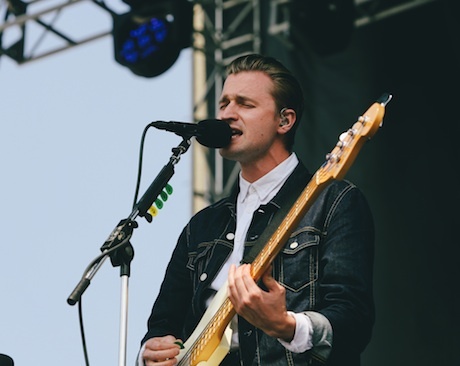 It's evident that Wild Beasts are better suited for a more intimate setting, but given their tenacious early performance, the band's equally compelling on the big stage.